Intensely hydrates and soothes the skin overnight. Upon waking, the skin's sensitivity is reduced, relieving skin from discomfort such as dryness, itching and redness every morning. An ultra-soothing overnight care to help reduce the occurrence of discomfort upon waking. Combines neurosensine, a strong soothing agent that targets the signs of irritation, with the carnosine and Vitamin E, to prevent against environmental aggressors exposed during the day. 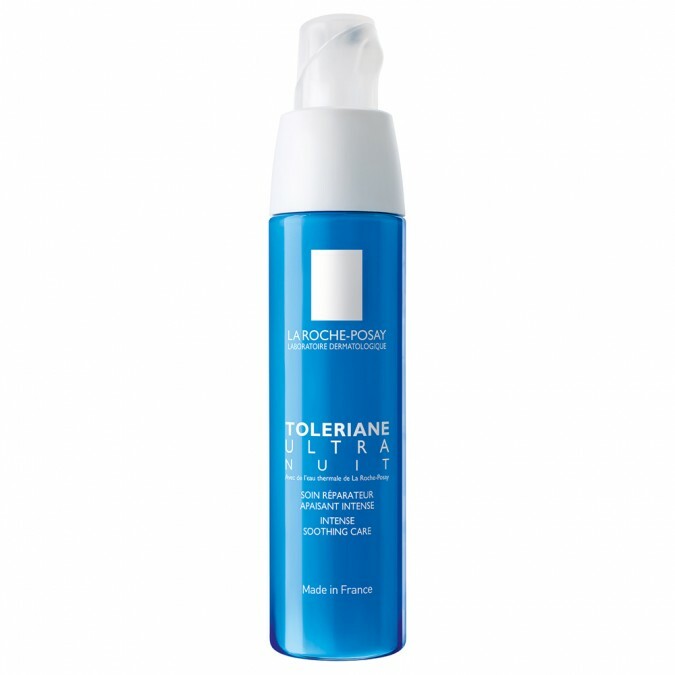 Enriched with calming La Roche-Posay Thermal Spring Water, naturally soothing and anti-irritation. New generation of ultra-hermetic packaging, ensuring purity with every application. Paraben-free, fragrance-free, alcohol-free, colorant-free and lanolin-free. AQUA / WATER, GLYCERIN, SQUALANE, PROPANEDIOL, BUTYLENE GLYCOL, BUTYROSPERMUM PARKII BUTTER / SHEA BUTTER, PENTYLENE GLYCOL, NIACINAMIDE, DIMETHICONE, AMMONIUM POLYACRYLDIMETHYLTAURAMIDE / AMMONIUM POLYACRYLOYLDIMETHYL TAURATE, POLYMETHYLSILSESQUIOXANE, POLYSORBATE 20, ALLANTOIN, GLYCERYL ACRYLATE/ACRYLIC ACID, COPOLYMER, DIMETHICONOL, ALUMINUM STARCH, OCTENYLSUCCINATE, CARNOSINE, DISODIUM EDTA, CITRIC ACID, ACETYL DIPEPTIDE-1 CETYL ESTER, XANTHAN GUM, T-BUTYL ALCOHOL, TOLUENE, SULFONIC ACID, TOCOPHEROL. Upon application it can sting a little due to the active ingredients. However, the next day your skin is totally fine for cleansing/ makeup/ SPF. It stops sensitivity over night for the next day but it isn't gentle when you first apply. I use it more like a serum than a moisturizer, I usually layer another moisturizer on top. It does really work and I think if you are sensitive/ eczema prone you should try it. A really great night cream - If you have oily skin it will leave you a little greasy in the morning but otherwise super hydrating and calming. A super-moisturising product, banishes any feeling of tightness on my face after cleansing. Combined with oily skin, this leaves me waking up to a super shiny face in the morning but is easily rinsed off and my skin is left feeling refreshed.